Thread stand not included. KIT 1 The original TOP 50 KIT New In Wrapper! EACH KIT HAS COMPLETELY DIFFERENT COLORS. 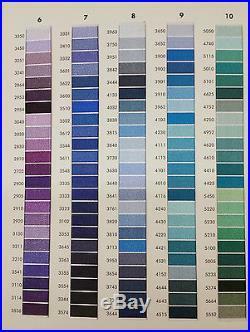 ALL 8 KITS MAKE UP THE COMPLETE COLLECTION OF 390 ISACORD COLORS. International Machine Group Inc. 50 B e a u t i f u l 1,000 meter cones of embroidery thread, made by the best name in the thread business. This is brand new Isacord thread. Don’t be fooled by imitations. Good quality thread means very few thread breaks, and a smoother running machine. With this tough German made thread you won’t have the thread break problems that rayon thread gives you. 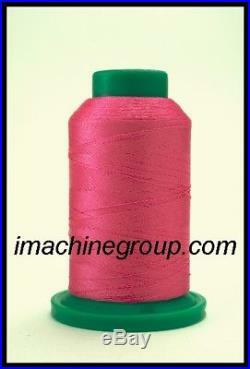 ISACORD is a polyester continuous thread that has a comparable shine to a rayon embroidery thread. This is obtained through a special cross-section modified fibre. ISACORD is wash, boil, and lightfast and also has a high resistance to chlorine and abrasion. Therefore, ISACORD is the ideal thread used for extreme treated textiles, e. Work wear, sportswear, jeans, catering wear, and leather. These listed examples can be washed with chlorine bleach or stonewashed without any problems. This thread kit is a great gift for all new embroidery shops or home sewers. 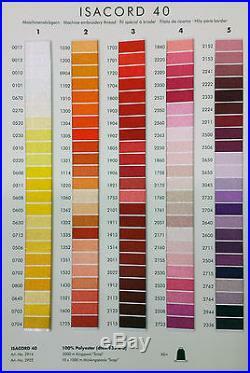 Here are the Isacord thread color numbers. 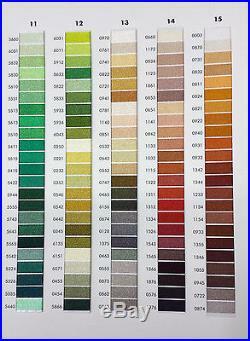 Isacord 40 Color Card. 100% Polyester (Nm 74/2). 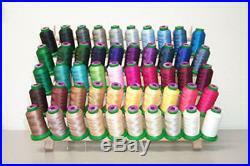 The item “50 Cones Isacord Polyester Embroidery and Quilting Thread Kit #1 New In Wrapper” is in sale since Monday, March 14, 2016. This item is in the category “Crafts\Needlecrafts & Yarn\Embroidery & Cross Stitch\Embroidery Machine Supplies\Machine Bobbins & Thread”. The seller is “imachinegroup” and is located in Fullerton, California. This item can be shipped to United States.